There aren't a lot of people with more than 280 million views on YouTube. Katy Perry's channel has 272 million. ESPN has 328 million. Madonna clocks in at 275 million and Funny or Die is getting close with 266 million. And then there's Evan, the 7-year-old behind EvanTubeHD, the kid- and parent-friendly YouTube channel that has racked up a staggering 272 million views in just a few years. What exactly does Evan do? He reviews his favorite toys and videogames. His dad records him, adds a couple of special effects, and then uploads the final video. Sometimes his mom or sister make a cameo. Occasionally, he'll review a local children's attraction. This little entrepreneur is big - and he got there without the money or resources of a top-tier network or record label, nor the cachet of Will Ferrell. 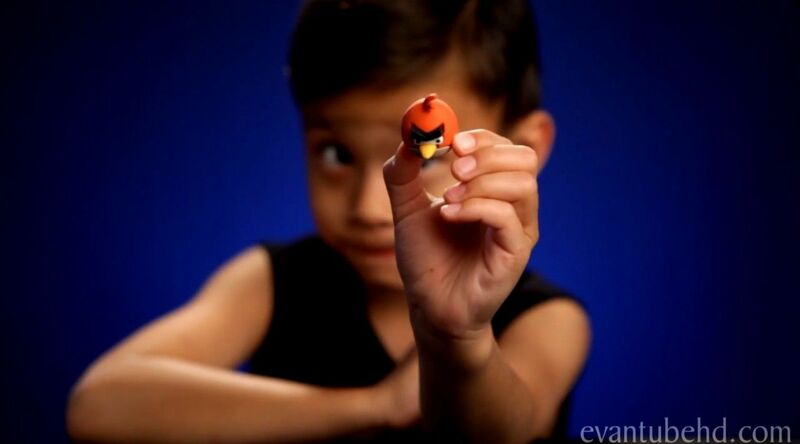 A couple of years ago, Evan and his dad started making Angry Birds stop-motion clay model videos. Evan asked to post them on YouTube to share with his friends. "When we started, we were making about a video per month as a fun little project," Evan's dad, Jared, recalls. "It was interesting to see who was tuning in. But it wasn't until our original clay model video hit 1 million views that we began to realize how huge this was getting." Soon Evan was getting requests to talk about toys. "And the rest is YouTube history," jokes Jared, who's also known as DaddyTube. "By doing toy reviews that are a bit 'out of the box,' we try to provide information about the product as well as have that creative flare." "My kids watch EvanTubeHD every single day," says Christine Wilson, who is raising two children in Arlington, Va. "They think Evan is super-fun and want to be his friend. They really love his Angry Bird videos. And I like that there's no cursing." Evan isn't aware of his borderline celebrity status. "For the most part, Evan goes about the day like any other second-grader. He goes to school, does his homework, hangs out with his friends, attends karate class, and, of course, he has his computer time," Jared says. "As the channel has grown, he has been recognized on several occasions.... I don't think he realizes the magnitude of the channel's popularity." And his parents want to keep it that way, for as long as they can. They decided not to share their last name for this article, and there's no identifying information on their YouTube channel. "My wife and I are a bit hesitant about publishing anything that could be used to track where we live or where the kids go to school," says Jared. "It may just be a case of paranoia or overprotective parents. But with the number of people who watch the videos and relative ease of finding personal information online, we'd rather err on the side of safety, especially since the kids are so young." Is the channel making any money? Jared gives a guarded answer: "There is significant money to be made on YouTube. And even though it probably could, we don't rely on any of our YouTube earnings to support our daily lives. "I run a photography and video-production company full-time. All the proceeds from our YouTube channels go directly into savings and investment accounts for the kids' futures. We figure that by the time they are of college age, these accounts will have accumulated to a nice sum." You think? Drawing 272 million video views makes for a pretty big chunk of advertising inventory to manage, so DaddyTube and MommyTube enlisted some help. They work with Maker Studios, an advertising network and production company that specializes in born-and-bred YouTube talent, including Toby Turner, an artist whose three channels have accumulated more than 2 billion views, and PewDiePie, a gamecaster who has the most subscribed channel on YouTube, with more than 14.5 million subscribers. Jared says they have a dedicated sales team that sells ads and negotiates deals with brands and businesses. "These include both ads that appear in and around each video as well as products actually featured in our videos. The majority of the revenue is generated by the ads placed on the video itself," he says. "Outside of the networks, YouTube/Google handles all ad placement within the site. Content creators have a few options regarding the format of ads they would like to allow on their videos. But the actual ads are chosen by some higher power." TubeMogul, a video-ad buying platform and YouTube flagship partner, examined traffic on the EvanTubeHD channel and estimated it brings in about $41,000 a year - and that's post rev-share with YouTube. Not too shabby for a father-son hobby. And their ad inventory is only going to grow. Evan and team recently launched two new channels: EvanTubeRaw, which features behind-the-scenes content, and a family vlog, and EvanTubeGaming, focusing solely on father-son videogame commentary and gameplay. And Evan's 5-year-old sister, Jillian, is hinting she'd like to be called JillianTube. Does that portend a possible new channel? "I don't know," DaddyTube says with a smile. "There is a pretty big market for makeup- and fashion-related videos, but I think we have a few years before we have to start worrying about that. "At least that's what I'm hoping."